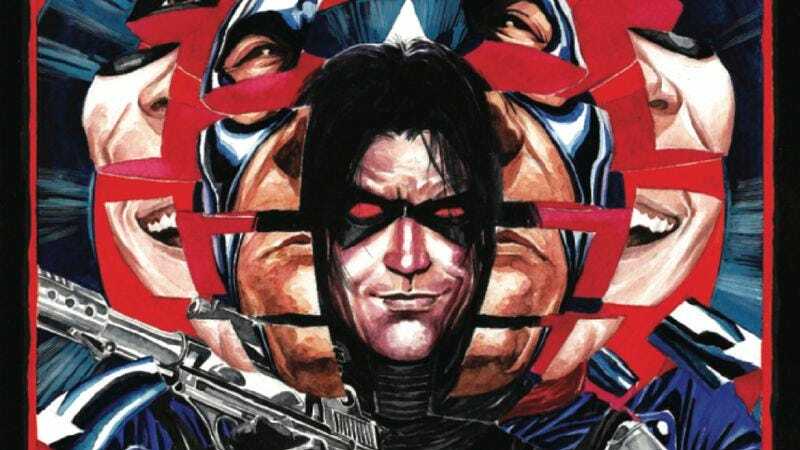 Bucky Barnes is a bonafide star following his key role in Captain America: The Winter Soldier, and Marvel is taking advantage of the character’s expanded profile with the launch of a new ongoing series for Captain America’s former sidekick. The events of this summer’s crossover event Original Sin have left Bucky with a new role in the Marvel universe as “The Man on the Wall”—the Earth’s first line of defense against interplanetary and extradimensional threats—and that position allows writer Ales Kot and artist Marco Rudy to go anywhere they want in the Marvel universe. This preview of next week’s Bucky Barnes: The Winter Soldier #1 shows that the creative team is going to be having a lot of fun with the concept, diving right into the action to show Bucky in chains on an alien planet where killing thoughts are impermissible. The political awareness of Kot’s work on Zero comes through in his approach to Bucky’s situation, quickly establishing that this title will not be afraid to explore deeper issues in the context of a fantastic superhero adventure. In just a few pages, Kot touches upon the nature of war while breaking down an alien political ideology, and manages to do so while still providing the intense superhero action readers expect from the character. Marco Rudy is one of the most innovative artists currently working in superhero comics, combining a keen eye for page design with a willingness to experiment with different rendering techniques that morph to fit the tone of the story at specific moments. These preview pages look unlike anything else being published at Marvel or DC right now, and Rudy’s bold layouts and ethereal watercolors dramatically amplify the impact of Kot’s script. There’s a lot of ambition on display here, and these are just the first five pages.